Sri Lanka with its capital Colombo is located in Asia (Southern Asia, island in the Indian Ocean). It covers some 65,611 square kilometers (slightly larger than West Virginia) with 22,409,400 citizens. Sinhala, Tamil and English are the languages commonly used by the people in Sri Lanka (consider regional differences). This country shares no land borders with another country. Sri Lanka formerly known as Ceylon, is in Southern Asia. It is an island country in the Indian Ocean, south of India. Since Sri Lanka is a tropical country, you can expect the rain anytime of the year in most parts. However, the two major rainy seasons are North-East monsoon (October to January) and South-West monsoon (May to July). The landscape is mostly low, flat to rolling plain and mountains in south-central interior. The average density of population is about 342 per km². The climate in Sri Lanka can be described as tropical monsoonnortheast monsoon (December to March), southwest monsoon (June to October). Potential threats by nature are occasional cyclones and tornadoes. To reach someone Sri Lanka dial +94 prior to a number. The local cellular networks are operated on 900 MHz, 1800 MHz, 3G, 4G. Websites typically end with the top level domain ".lk". If you want to bring electric appliances (e.g. battery chaarger), keep in min the local 230 V - 50 Hz (plugs: D, G). The sign for the locally used currency Rupee is LKR. 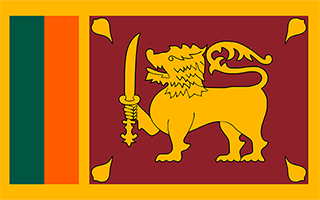 Yellow with two panels; the smaller hoist-side panel has two equal vertical bands of green (hoist side) and orange; the other larger panel depicts a yellow lion holding a sword on a maroon rectangular field that also displays a yellow bo leaf in each corner; the yellow field appears as a border around the entire flag and extends between the two panels; the lion represents Sinhalese ethnicity, the strength of the nation, and bravery; the sword demonstrates the sovereignty of the nation; the four bo leaves - symbolizing Buddhism and its influence on the country - stand for the four virtues of kindness, friendliness, happiness, and equanimity; orange signifies Sri Lankan Tamils, green Sri Lankan Moors, and maroon the Sinhalese majority; yellow denotes other ethnic groups; also referred to as the Lion Flag. The first Sinhalese arrived in Sri Lanka late in the 6th century B.C., probably from northern India. Buddhism was introduced circa 250 B.C., and the first kingdoms developed at the cities of Anuradhapura (from circa 200 B.C. to circa A.D. 1000) and Polonnaruwa (from about 1070 to 1200). In the 14th century, a south Indian dynasty established a Tamil kingdom in northern Sri Lanka. The Portuguese controlled the coastal areas of the island in the 16th century and the Dutch in the 17th century. The island was ceded to the British in 1796, became a crown colony in 1802, and was formally united under British rule by 1815. As Ceylon, it became independent in 1948; its name was changed to Sri Lanka in 1972. Prevailing tensions between the Sinhalese majority and Tamil separatists erupted into war in 1983. After two decades of fighting, the government and Liberation Tigers of Tamil Eelam (LTTE) formalized a cease-fire in February 2002 with Norway brokering peace negotiations. Both the LTTE and the government unofficially abrogated the ceasefire and violence between the LTTE and government forces intensified in 2006, but the government regained control of the Eastern Province in 2007. The government officially withdrew from the ceasefire agreement in January 2008 and by May 2009, the remnants of the LTTE had been defeated. Since the end of the conflict, the government has enacted an ambitious program of economic development projects, many of which are financed by loans from the Government of China. In addition to efforts at reconstructing its economy, the government has resettled more than 95% of those civilians displaced during the final phase of the conflict and released the vast majority of former LTTE combatants captured by Government Security Forces. Progress continues to be made on more contentious and politically difficult issues such as reaching a political settlement with Tamil elected representatives and holding accountable those alleged to have been involved in human rights violations and other abuses during the conflict.